I’m sure that most of you reading this will be familiar with Kyoto Animation’s swimming show, Free!. Since the series’ successful debut back in 2013, some studios and mangaka have tried to capitalize on Free!’s fame by launching or adapting similar series. The latest to make its way to the West is the Dive!! 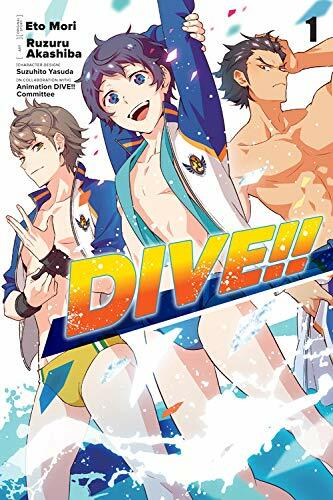 manga, a series being released by Yen Press that’s focused on the sport of diving. Today I’m here to check out the first volume to find out what it offers. The story begins with Tomoki Sakai, a second year in junior high and a member of the Mizuki Diving Club. Tomoki has been in love with diving since his second year elementary school and has devoted his life to it, but now the club is in danger of being shut down. With a lacklustre record, the club is in danger of losing its sponsors – but new diving instructor Kayoko Asaki thinks she can turn things around! All the club needs is for someone to qualify for the upcoming Olympics, but with the deadline fast approaching, the divers will need to work extra hard to save their club. As it turns out, the Mizuki Diving Club is home to some talented divers. Tomoki is double-jointed, which gives him a great deal of flexibility for a sport like this, so Kayoko is quick to instruct him to pull off a three-and-a-half somersault dive in time for the qualifiers. Meanwhile, Tomoki’s fellow club member and rival, Youichi Fujitani, is the son of a former Olympic diver and is the undefeated champion amongst the juniors. What’s interesting to see throughout this volume is how the goal to qualify for the Olympics divides the members of the club. There are those like Tomoki and Youichi who live to dive and are hungry for the opportunity, but also those who only enjoy diving as a pastime and feel like the new coach is playing favourites. It makes for an intriguing read and opens the door for lots of character development among the kids. This edition of Dive!! is based on the anime adaption, which aired in the summer of 2017. I confess that I did try watching the anime at the time but got turned off by the unattractive character designs and weak story. However, I enjoyed this a lot more in manga format – and with cuter character designs – than the anime. The anime was based on a light novel series, which has already had an earlier manga adaptation, so I think it’s important to state clearly that this version is based on the anime and not those light novels. That said, this isn’t a big concern as neither the original light novels nor the first manga adaptation have been licensed in English at present. The only real disappointment here is that Dive!! is much more focused on the cute boys and making their dives look good than talking about the technical aspects of diving. There are a few comments made by the coach about how the kids can improve their dives but, by and large, there’s a noticeable lack of information. It’s certainly no Haikyu! !, which loves to teach us various things about volleyball. As far as sports manga go, I feel there are better series out there than Dive!! but it’s enjoyable enough to pick up if the concept piques your interest. The series has been adapted into manga by Ruzuru Akashiba, who draws the cast attractively while also making them muscular. The dive scenes are captivating and have a real sense of depth and height to them. Akashiba also gives the characters a wide range of expressions during their day to day interactions. I’m especially fond of the sparkly-eyed look Tomoki often sports while talking about diving. This release comes to the West thanks to Yen Press, who are set to release Volumes 2 and 3 later this year. This volume includes colour pages at the beginning and has been translated by Christine Dashiell. The translation reads well and does a good job of capturing the enthusiasm and personalities of each of the characters. Overall, Dive! !’s first volume proves to be an enjoyable read. It’s somewhat difficult to recommend to fans of the sports genre with its reluctance to talk about diving in any detail, but those of you looking for a slice of life about diving will fare better. At the very least this works as a good alternative to the Dive!! anime if you previously had interest in it. The mangaka behind Erased is back with new series: For the Kid I Saw In My Dreams. Demelza takes a look to find out if this new manga lives up to Kei Sanbe’s previous work.